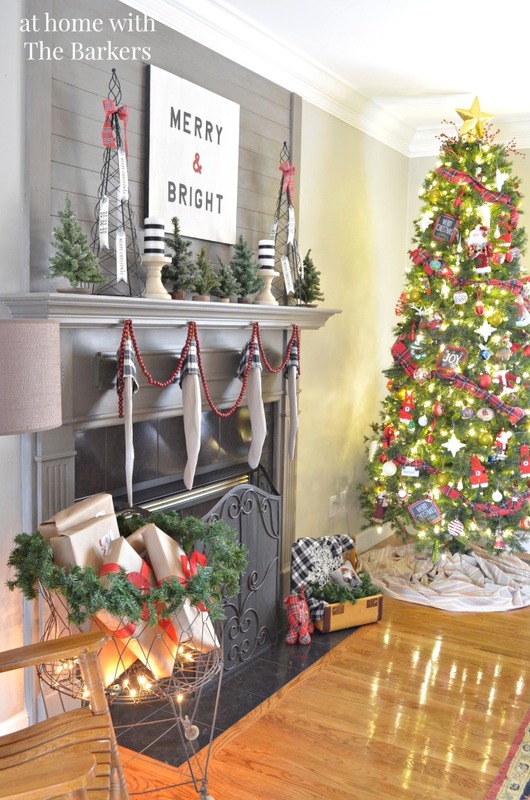 I have been posting so many Christmas projects getting ready for this one day… My Christmas House Tour. It’s finally here! Which, by the way, happens to be my birthday. I’d like to thank Jen from Migonis Home for hosting such a great event and including me! 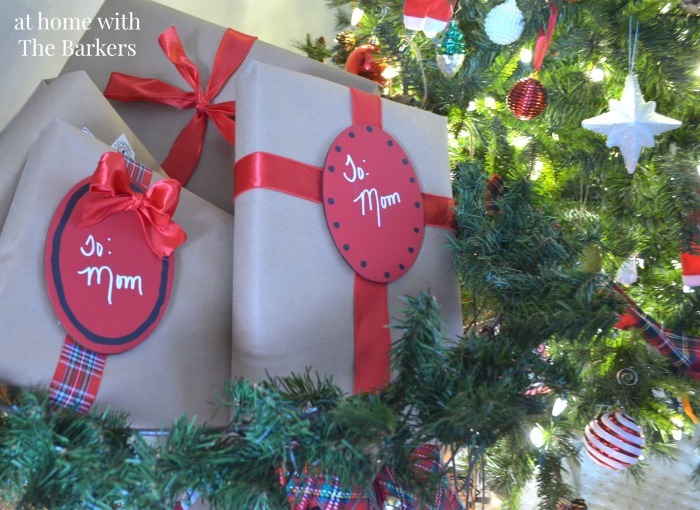 When it comes to Christmas decor I am a red girl all the way! I will usually change up the accent color that I am combining with the red but red has to make it’s way in there! 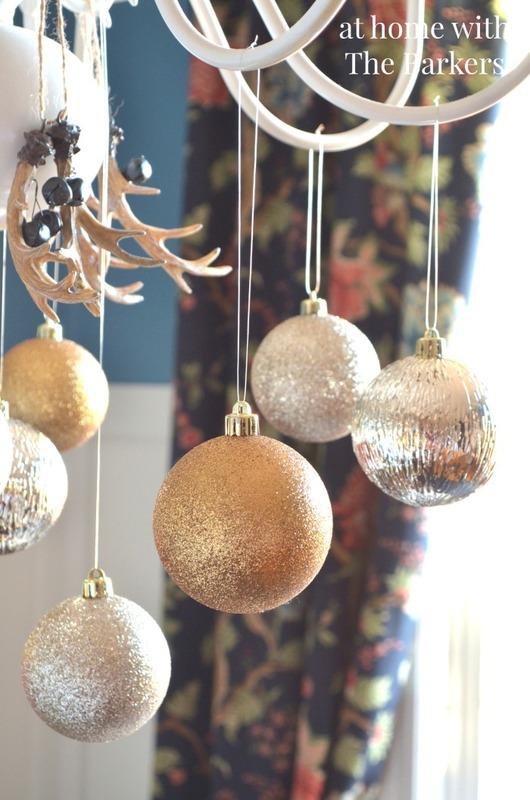 This year the accent colors were black, navy and metallics. I used some of each of those colors in different rooms. See my plaid bow…more tablecloth! 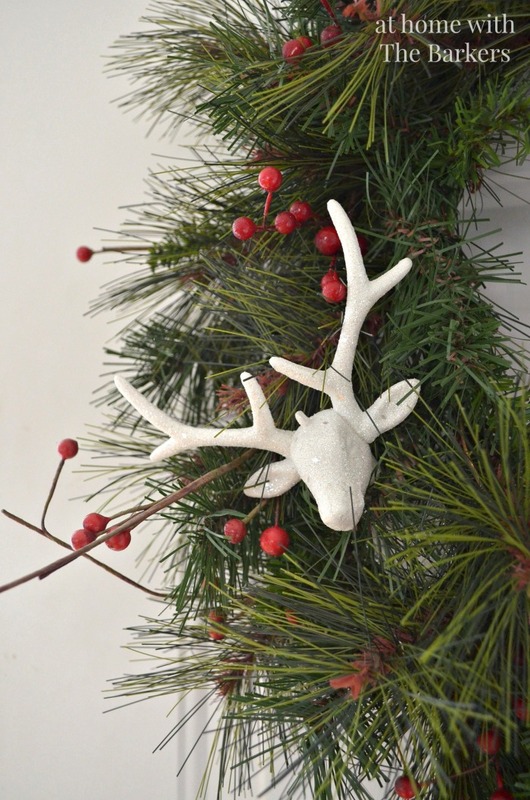 The white deer heads are Christmas ornaments I bought at Walmart. As you can see for my living room I concentrated on mostly accenting with black. The MERRY & BRIGHT Sign was a DIY from last year. I have a full tutorial on how I made it on the blog as well. 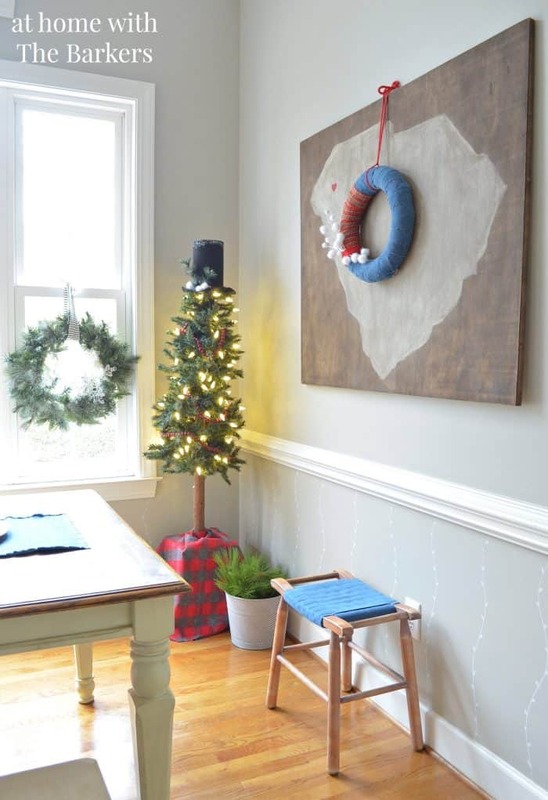 This year I wanted new stockings so I made DIY Drop Cloth Stockings. They were quite simple to make. Are you seeing a pattern here??? I tend to do lots of easy DIY. I love using my vintage laundry basket that I scored this summer at a yard sale for $5. Our kids have always taken turns putting the gold star on the tree…I love this tradition. 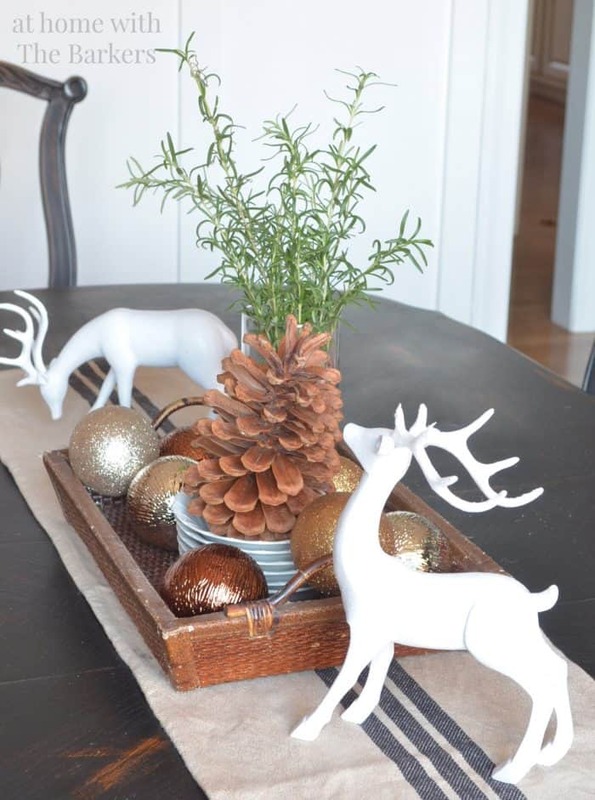 I posted my Dining Room Christmas decor last week but here are a few pictures of that space as well. 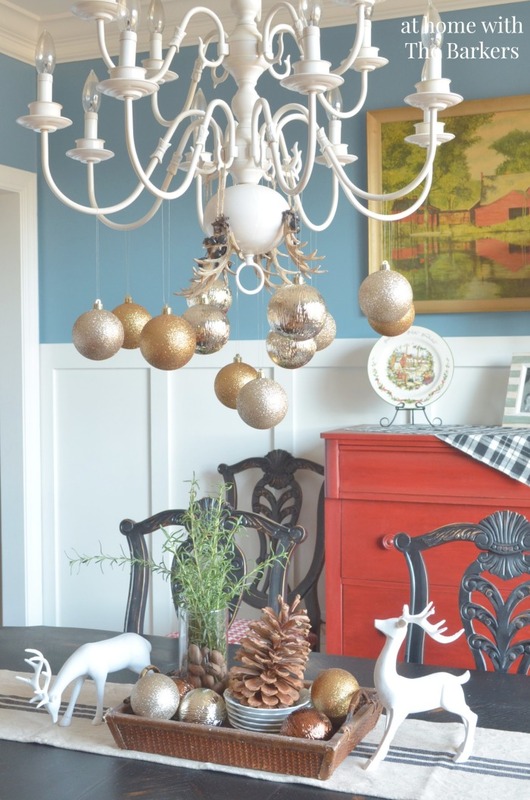 This room already has the reds, blacks, and navy in the furniture and fabric so for my Christmas decor I used metallics. 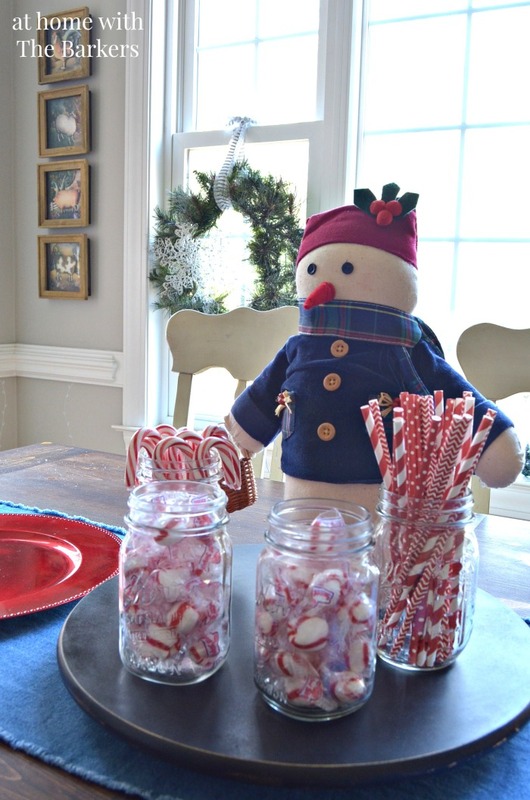 For my kitchen I went with a snowman theme. 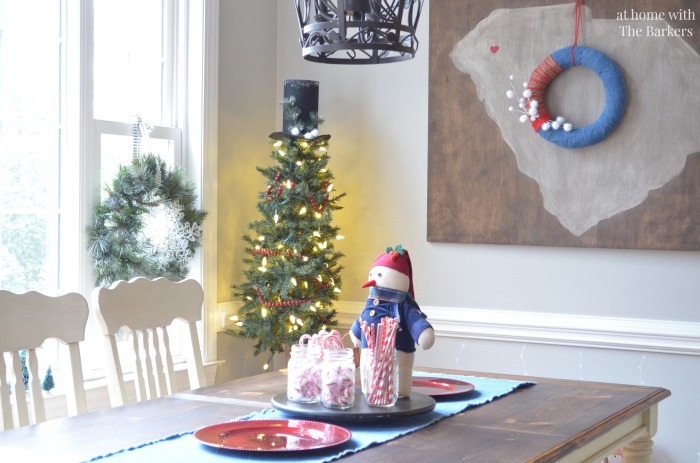 I loved decorating my South Carolina Art…There’s no place like home for the holidays! I am so happy you have joined me today on the tour. I would love to have you follow along with me by adding your email in the subscribe box at the top and on Instagram and Facebook. Now for all of the the other fabulous bloggers on the tour TODAY! After you are done with those tours you can come back and check out Monday. The entire week tour is listed below so you can follow along all week! Beautiful home for the holidays! Love all the white deer! A little tree over load this year…at least I didn’t have to hang ornaments on them all. Everything looks so petty Sonya! I still love your sign from last year and that laundry basket. Oh my! Merry Christmas friend! Thanks Melissa! It is my favorite. You know I love plaid! Everything looks perfect! Ahhh I love your style! It’s actually just like my decor this year, ha! You did such an amazing job, can’t wait to see the rest! It looks beautiful! 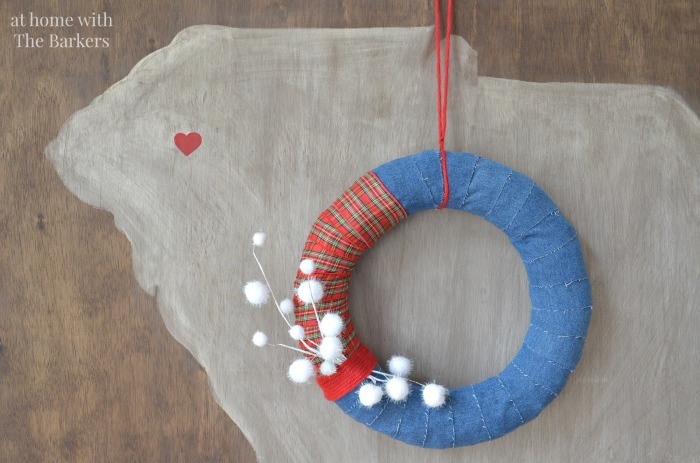 That deer head wreath is adorable. Love it! So fun and festive! Love your hat tree topper! I love your home tour, your fireplace is beautiful. 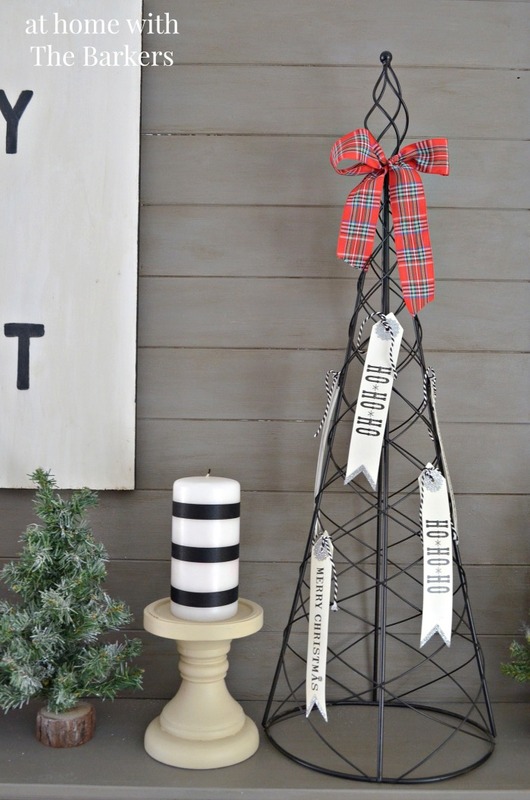 I love the plank wood and the gray colors, looks awesome with your stockings! Sonya I think everything looks so welcoming and warm. 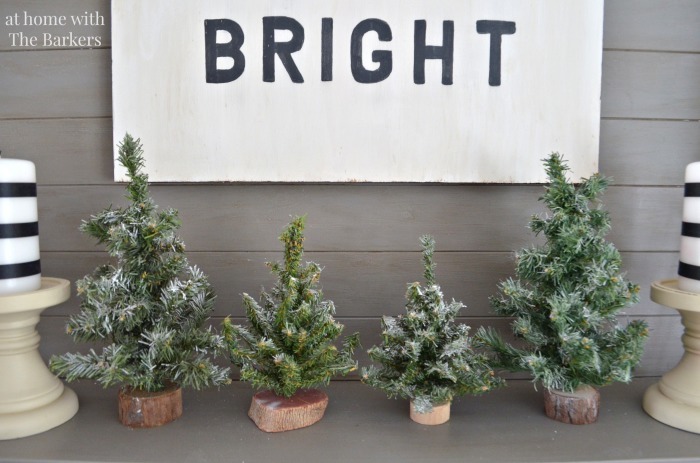 I love all your little trees! Enjoyed being on the tour with you today…Happy Christmas! your home is gorgeous- i especially love your mantle! Thanks! 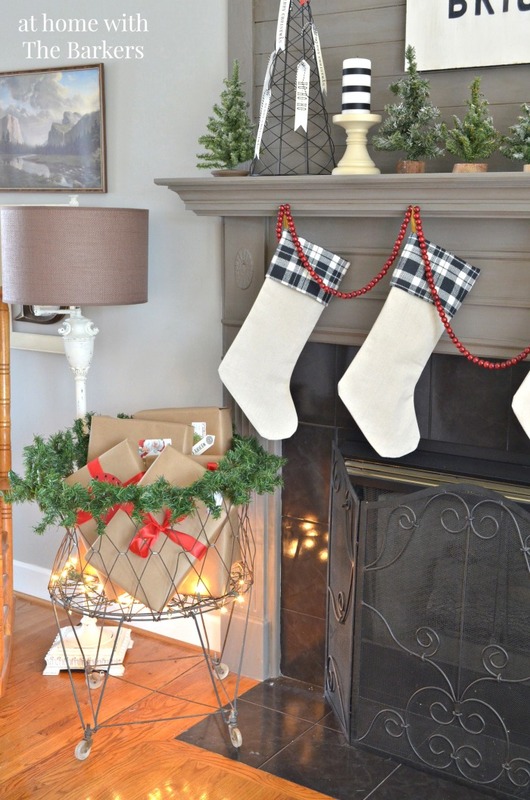 The mantel is one of my favorite DIY’s from this year. So, so beautiful! 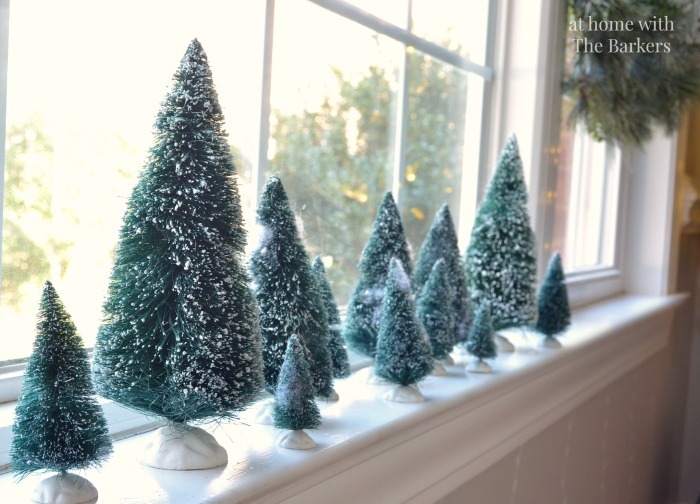 I absolutely adore your mantel decor! Thank you for sharing your gorgeous holiday home with us… pinned! 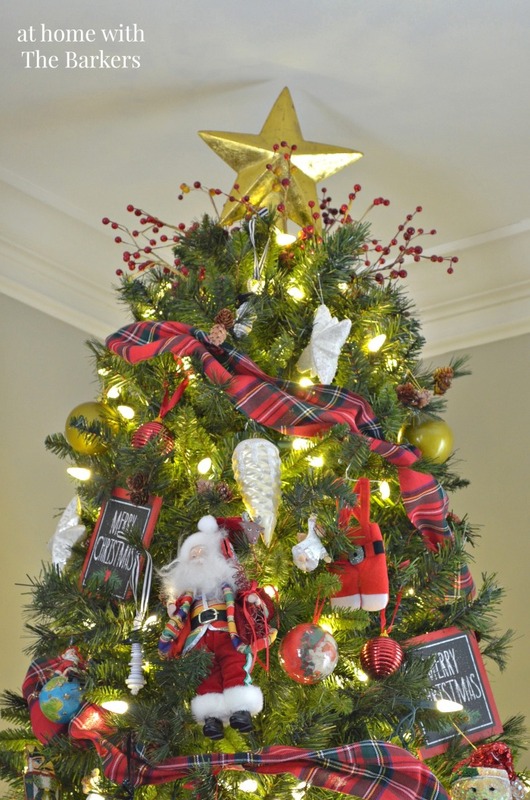 I love the tree in your dining room with the hat! So cute! You are so sweet Roeshel! Love seeing pics of that sweet grandbaby! Girl, I am with you – gotta have my red in there for Christmas – otherwise it just doesn’t feel right!!! 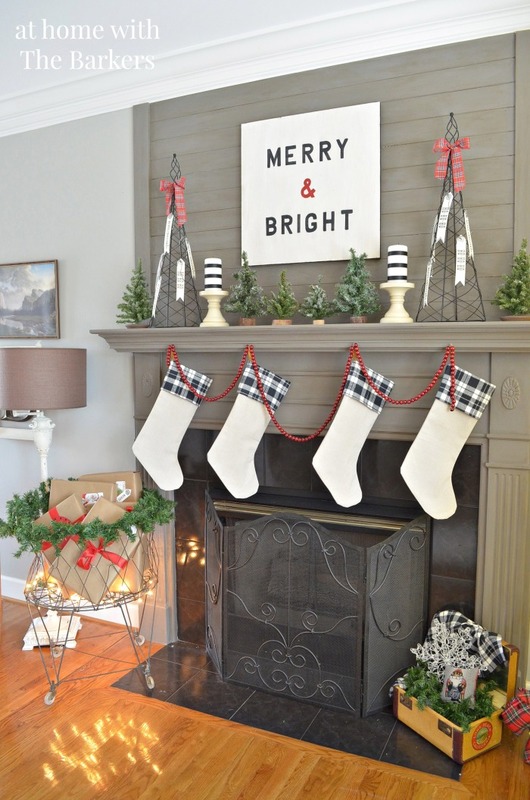 And I know I’ve already told you, but I’ll say it again – LOVE the Merry & Bright sign! Beautiful tour, Sonya! I just LOVE the deer wreath on your front door! All your decor looks fab! 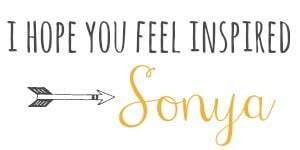 I love it all Sonya- so many pretty, fresh, and bright touches and beautifully executed DIY projects. 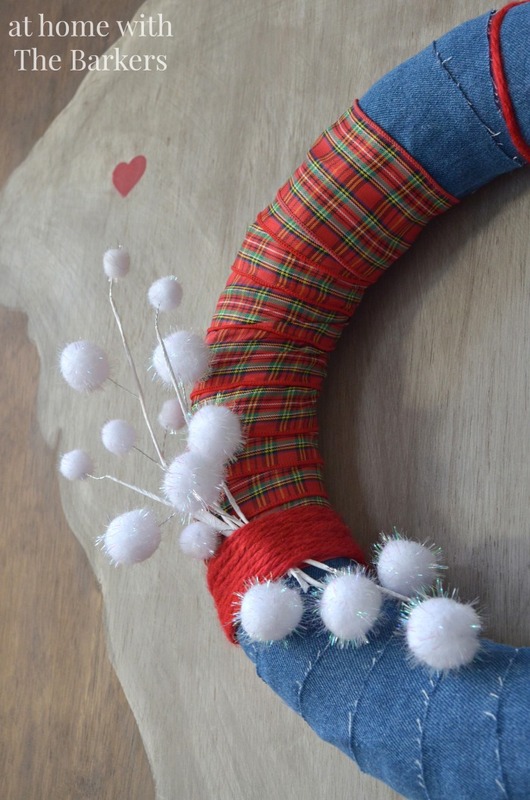 I love your plaid edged drop cloth stockings… I made some too but I think I would call my post (if I ever write one) “how not to sew Christmas stockings”… lol. At least I figured out what to do now! 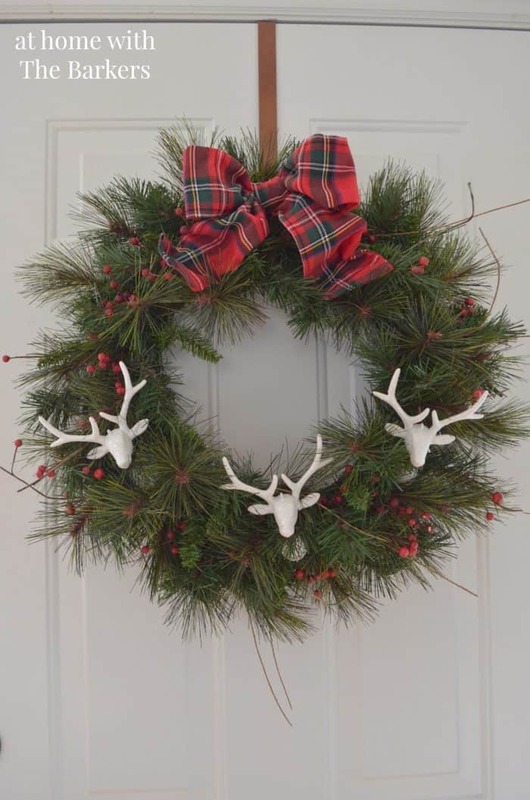 I love that wreath with the deer heads on it – so fun!! It was great to be on this tour with you- I’m sharing your tour on my FB page this weekend and pinning, of course!